I also noticed this and contacted Robert, and he confirmed this is a 24/192 PCM recording, not DSD nor 24/96 (as listed on this site). I have had this disc for a week now and it is magnificent. 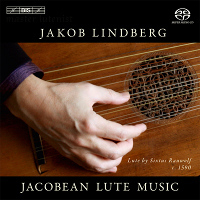 Apart from the performance (Lindberg has never sounded better), the lute (in this case an original 1590 or so instrument) really benefits from the "SACD treatment". The effect is so striking I think every lute recording should be issued as an SACD - though, of course, the skill of the engineer is a major factor too. Congratulations to your team and you for this excellent recording. Do you mean this disc? I should receive it in a few days...now my anticipation is growing! Do you mean this disc? Oops, I forgot to paste in the disc details! I just listened to this last night. It is a wonderful recording of varied lute pieces, which Mr. Lindberg plays beautifully as well. I have his recordings on BIS vinyl and I think his playing is just as good if not better on this release. I concur--the sound is fantastic. To my ears, it's the perfect blend of detail and spaciousness. Jackob's playing is great, too. Perhaps a few 32nd note runs here and there lack the last bit of articulation, but that is hard to achieve without nails! As David said: The information on eclassical.com seems to be corrected. Now it is clear. In another forum I read, that this "upsampling" of original 44.1kHz recordings affects a lot of more BIS Records, and it seems to be an error by Naxos or Qobuz.